Exciting news! Axiom Performance Gear announced today that they will be donating two full sets of their popular Randonnee Series panniers and Barkeep DLX 9 handlebar bags to the 2014 Bicycle Touring Pro Travel Scholarship – a unique micro-scholarship designed to help young, first-time bike travelers get their start in the world of self-supported bicycle touring. Click here to learn more about Axiom’s Randonee Series panniers. Axiom is a Canadian company with a global presence committed to helping cyclists ride more and live better. This 25+ year-old company makes products that are designed and tested by avid cyclists, so every minute detail is painstakingly considered before a final design is approved. The end result is a lineup of superior cycling accessories that meet the specific, everyday needs of people who ride bikes. 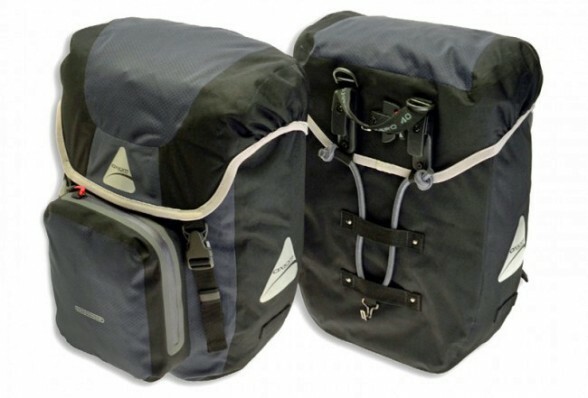 Because of Axiom‘s commitment to helping cyclists of all age levels, the company has agreed to sign on as the official co-sponsor of the 2014 Bicycle Touring Pro Travel Scholarship and will be giving away two full sets of panniers to two lucky individuals on March 28, 2014. Axiom’s crossover series, Randonnee panniers are superior quality bags that work well as either touring or commuting bags. Randonnee bags feature Axiom’s waterproof Sonictech fabric, which is a lightweight and exceedingly durable premium polyester. These highly functional bags are equipped with fully waterproof engineered external pockets and convenient internal organizer pockets for added versatility – so everything stays dry and has its place. Click here to learn more about Axiom‘s Randonee Series panniers. This entry was posted in Bicycle Touring Pro Articles, Main Articles, Panniers, Products, Videos, Website Announcements and tagged axiom, axiom handlebar bag, axiom panniers, axiom performance gear, axiom randonnee, axiom series panniers, axiom waterproof panniers, barkeep handlebar bag, randonnee series, randonnee series panniers, waterproof panniers.